Bracelets have been around since 5000 BC. While Hardy’s doesn’t have any dating back quite that far, we have had some remarkable period bracelets, occasionally offered, from the 1920s, that have proved to be very popular. Needless to say, Hardy’s has a unique selection of bracelets from which to choose. Consider our beautiful Italian import collection of bracelets in 18K yellow gold. Our beaded bracelets are also a favorite in amethyst, malachite, aquamarine or multi-gem combinations. The straight line diamond bracelet that features a symmetrical pattern of diamonds remains popular and is an item we proudly create to your specifications. It was in 1987 and Chris Evert was playing in the U.S. Open. She was wearing an elegant, straight line diamond bracelet which accidentally broke and the match was interrupted to allow Chris to recover her precious diamonds. The “tennis bracelet” incident sparked a new name for the item and a huge jewelry trend. Tennis bracelets continue to be worn by tennis stars like Serena Williams and Gabriela Sabatini. 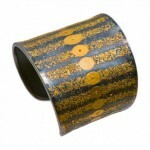 Bold and unusual, we currently have a Neissing 18K yellow and white gold bangle bracelet that is impossible to ignore. Think 5th Avenue chic and you’ll get it.